Brambles are one of those plants that display perfectly how the abundance and resilience of a particular species can make it beloved by some and loathed by others. Blackberries, the fruit of the bramble or Rubus fruticosus, must be by far the most popular and well known of wild foods, growing in practically every hedgerow and irresistible to all who pass by. 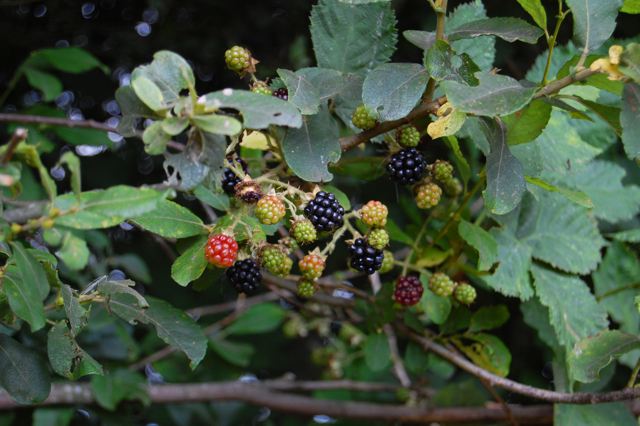 Yet the bramble is also the gardener’s bane, invasive, fast growing and difficult to eradicate, this woody weed is a far from popular addition to most gardens. Here at our new house we have quite a bit of it growing through the area we hope will become our veg patch and, whilst I’m not exactly thrilled to see it there, it’s humbling to remember all the gifts of food and medicine that brambles give to us each year and seek to find ways to manage it naturally, principally by using it freely. As we follow brambles through the year we can find something of use at all times except darkest winter. In early spring the leaves and young shoots can be used as a pleasant tasting, cleansing and tonifying tea. The leaves can be harvested throughout the summer and are a valuable astringent due to their tannin content. Traditionally they were used to treat diarrhoea, sore throats and dysentery. The root bark is a stronger astringent, indeed it may be too strong for people with very sensitive stomachs, and is also useful in cases of diarrhoea as well as spasmodic coughs. I don’t have any experience with using the root bark myself though I have made the leaves into teas and an infused oil which is helpful for bumps, bruises and minor injuries. The oil or tincture also make a valuable addition to creams or salves for treating haemorrhoids and varicosities, due once again to their astringency. The leaves have been recommended for treating bleeding gums for this same reason, as well as for their vulnerary properties. An infusion of the leaves or root can also be used as a compress or formentation for sores, burns, varicosities and minor wounds. The inner part of the spring shoots can also be eaten as a tasty, crunchy vegetable, either raw in salads or lightly steamed or stir fried. Just peel the outer portion of the stems back to reveal the yumminess within. Later, as the flowers begin to form in summer, a lovely flower remedy can be made which I have found useful for people who are good natured and generous at heart, but can tend to be over-dominating. The American FES remedies make a blackberry essence which they claim “helps the person who cannot make a viable connection with the will. The soul has many lofty visions and desires but is unable to translate these into concrete manifestations.” I suppose both these things relate to the ability of the blackberry to make its mark on the world, but in an appropriate way! It would be interesting to hear anyone else’s experience of blackberry flower remedy and what they have found it useful for. Now, on to the berries themselves! Though they are probably most delicious straight from the bush and still warm from the late summer sun, there are numerous things that can be done with a blackberry. Cakes, crumbles, biscuits, smoothies and many other puddings benefit from their flavour but they are also useful in promoting health as they are full of vitamins and antioxidants. They are high in vitamins C and K, folic acid and manganese and rich in the antioxidant polyphenols which are thought to be beneficial in preventing a host of diseases. One way I enjoy my blackberries later into the season is by infusing them in apple cider vinegar for use as a deliciously fruity salad dressing. This could also be taken with a little warm water and raw honey as a remedy for gout and joint stiffness. In fact, blackberry was used by the ancient Greeks as a cure for gout. 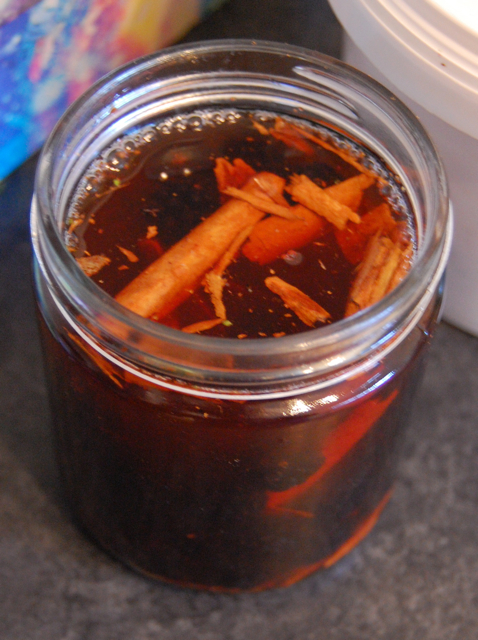 I made my blackberry vinegar with the addition of a cinnamon stick this year to make it extra warming and delicious for this time of year. Just lightly fill a jar with blackberries and one cinnamon stick broken into pieces, then cover with apple cider vinegar and leave to infuse for a month, swirling the mixture daily for the first week. Be sure to cap with a plastic lid as the vinegar will erode metal. The bramble is a plant surrounded by folklore and superstition. A sacred plant of the Druids, it was said to protect the faery realm and was also connected to the Goddess. Mrs Grieves tells us that they “were in olden days supposed to give protection against all evil runes, if gathered at the right time of the moon.” Walking or crawling under the arch of a bramble shoot was thought to cure a variety of diseases from whooping cough to warts, though I’m inclined to believe all the scratches just took your mind of any other problems you were experiencing! Even today it is thought unlucky to eat blackberries after Michaelmas, as they have been claimed by the devil. This is actually quite sensible as they are often infected with fly eggs from around this time… so let the devil keep ’em. I’ve just realised that leaves us only six more days to gather as many as possible… so I’m off! 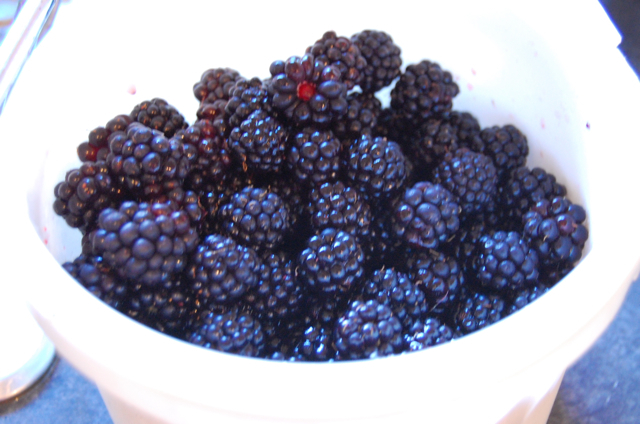 The blackberries are about finished off here, so I will have to remember the vinegar for next year – sounds delicious! I love how all the old superstitions have such practical sense hidden in them. Your flower essence description so perfectly captures the spirit of the plant too, and I certainly know some people who would benefit by this remedy!